First log in to your Amazon AWS account at https://console.aws.amazon.com, make sure you are on the same account where your Amazon S3 buckets are, and click IAM (Identity & Access Management) in the Services menu. Enter your IAM user name. Below you can select the access type of the new user. Select the Programmatic access, then click Next: Permissions. Now you need to set the permissions for the new user. 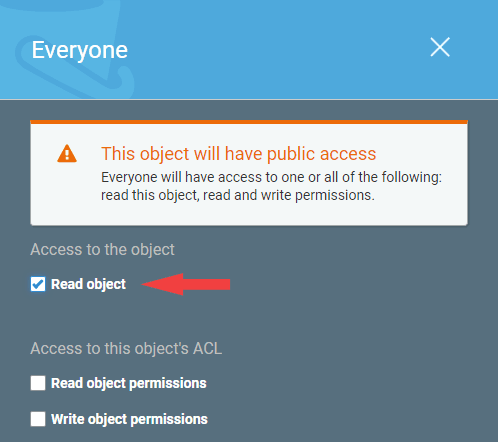 Click on the Attach existing policies directly icon and pick AmazonS3ReadOnlyAccess and CloudFrontReadOnlyAccess. Scroll to find it. Click Next: Tags. The next screen is for adding tags. It's optional, so add them if you wish. Click Next: Review. At the review screen, click the Create user button. This will take you to the final screen with the Access key ID and Secret access key. Once you leave this screen, you won't be able to get to the Secret access key again, so it's important to save it now. Click Download .csv. Now you can also copy the Access and Secret access keys and paste them into FV Player's settings - namely to Settings > FV Player > Hosting tab > Amazon S3 Protected Content. 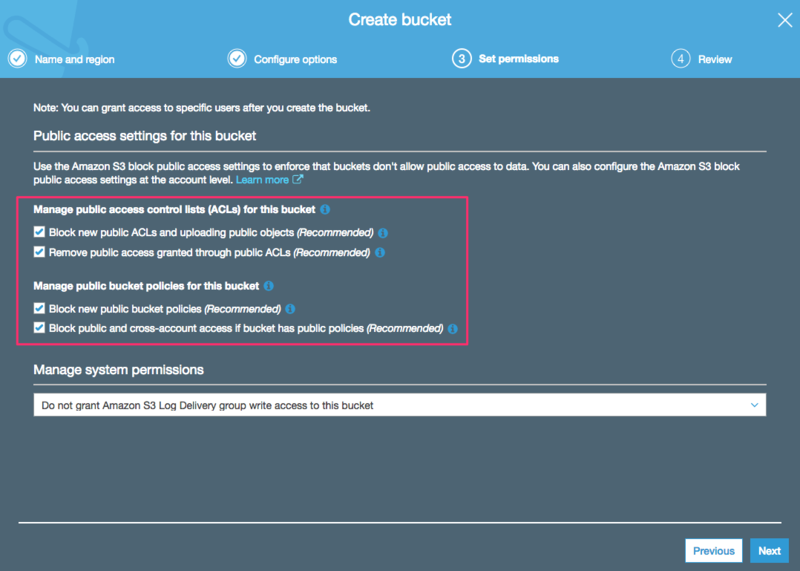 You will also need an Amazon bucket name and the location of your bucket, which we will create in the next section of this guide. 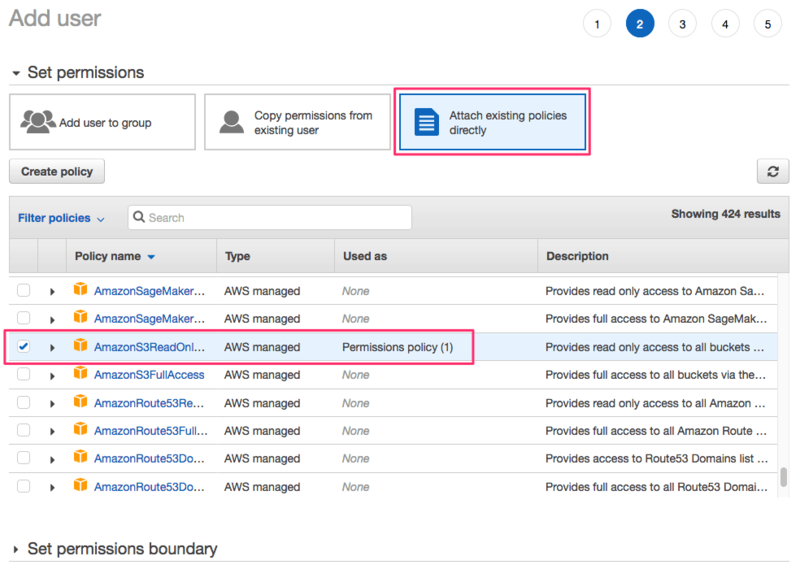 Paste the copied access keys into the corresponding fields of the Amazon S3 Protected Content section and click Save All Changes. That's it. 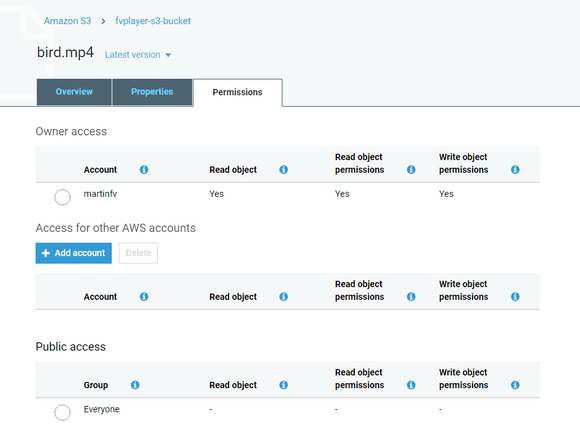 Now the access keys can be used to play private videos from your Amazon S3 account. First, log in to your Amazon AWS account. Then go to Services > Storage and select S3. 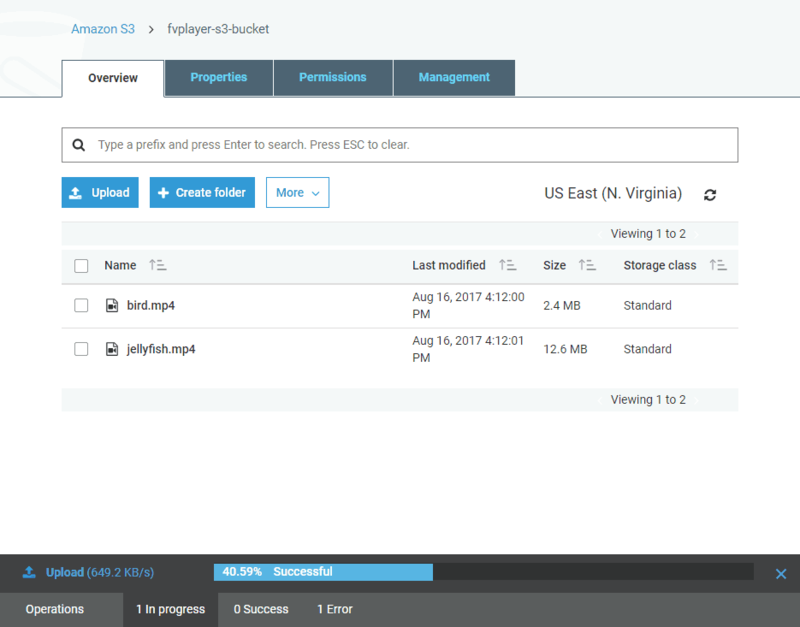 Define your unique bucket name and select the Region, based on your location or the location nearest to you. Then click Next. 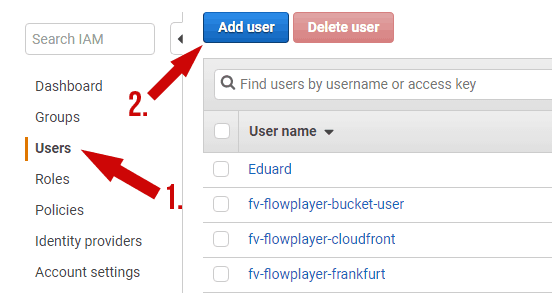 The second step is for setting the properties of the bucket, namely Versioning, Logging and Tags. These are not necessary to set right now, so you can skip to the next step. You can always set these later. That will allow you to choose if you want to not grant public read access to your bucket (default) and protect the content, or make it open. You can read more about this in the Managing Access Permissions part of this guide. Last step will show you the review of your previous settings. 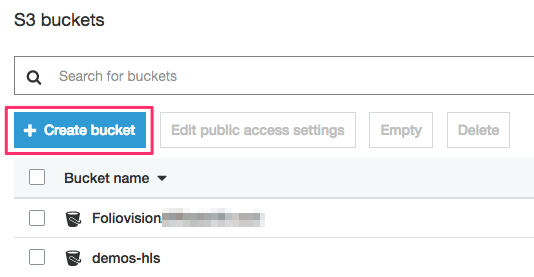 If all is okay, you can click on the Create bucket button. 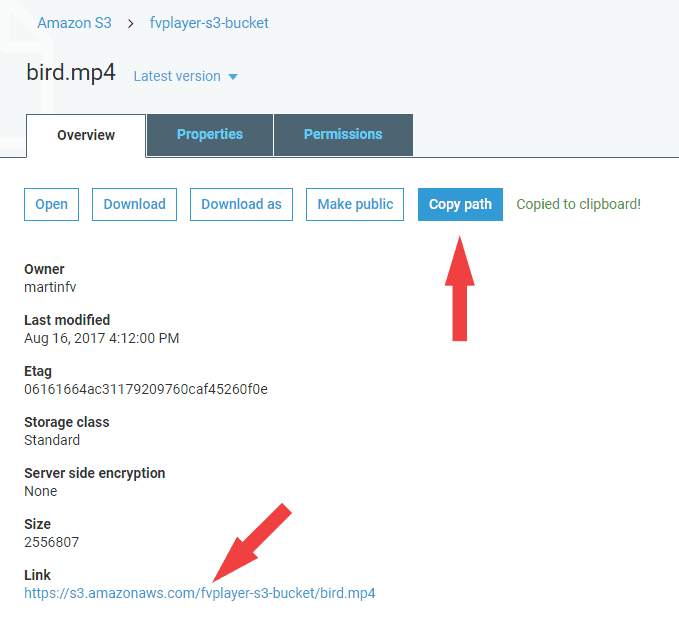 If you are interested in file protection, also enter the bucket name and its location into Amazon Bucket and Region fields at Settings > FV Player > Hosting tab > Amazon S3 Protected Content. Obtaining the access keys is described in the previous part of this guide. There is also the Default Expiration Time field. When you post your video, FV Player checks its length and makes sure the link expiration time is big enough for the video to be loaded into the buffer properly. If the check fails, the value of the Default Expiration Time field is taken into account. You can also force the time you set by turning on the Force the default expiration time option. Make sure you set the Default Expiration Time to twice as much as your cache timeout, and check Force the default expiration time checkbox. Otherwise the video source URL's in the cached HTML will expire and the videos won't be playable. This way the video duration won't be used for calculation of expiry time. If you use WP Super Cache, turn on Settings > WP Super Cache > Advanced > Don’t cache pages for known users. If you use other plugins, you should be able to find this setting as well. Open your bucket by clicking it. You will see there are no files yet. Click on the Upload button. Click Add Files to pick the desired video files from your computer (or drag and drop them in the respective area). You can select as many files as you want and add them from different folders with the + Add more files button. Then click Next. Important note: The names of your files and folders shouldn't contain spaces. S3 will convert the spaces to "+" symbols and links with these symbols may cause some trouble on certain mobile devices (for instance iOS devices). Use "-" instead of spaces, for example "my-test-video.mp4", instead of "my test video.mp4". Naming scheme: S3 recommends naming files using only letters, numbers, underscores and dashes. And folders using lowercase letters, numbers, dots and dashes (NO underscores front or back slashes). 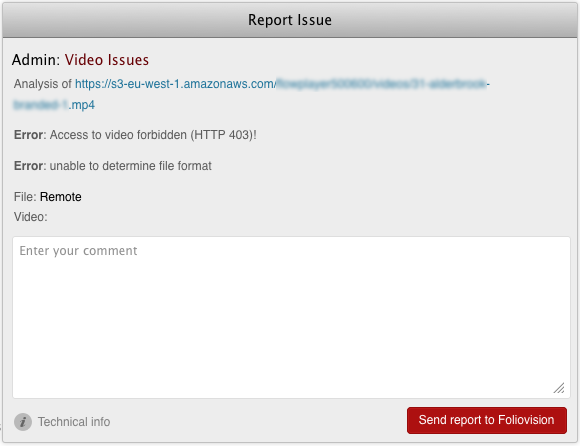 Improper naming will cause video issues and no video will be displayed. In the next step you can set the permissions. 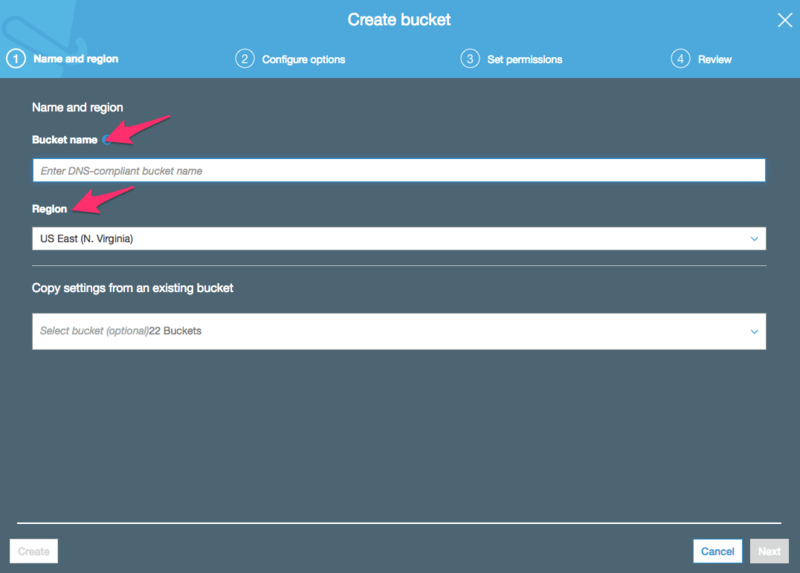 Set the same option you selected in step 5 of the Creating a New Bucket part of this guide and proceed to the next step. After entering the correct value, you can click on the Save button and then move to the next step. Last step is a review of your previous settings. If everything is okay, then click on the Upload button. A progress bar will appear at the bottom of the page and you will be able to see the videos appearing in the bucket once they are uploaded. Now click on the video you want to post on your website with FV Player. You will see it's properties, and most importantly, the URL. Copy the URL (you can use the Copy path button). You can now paste it into the Video field of the FV Player shortcode editor or into [fvplayer] shortcode in src="" parameter. See the basic video posting guide if you need help. 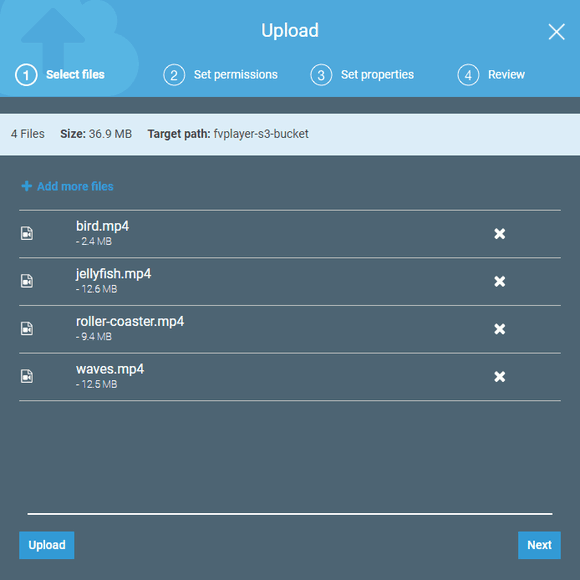 The next steps will illustrate how to set permissions for an individual video, but these settings can also be applied to a whole bucket. To make the video accessible to everyone, click on the video in your bucket to access it's settings, and select the Permissions tab. Go to the Public access section and select Everyone from the list. A new window will appear on the right side of the screen, where you can select the Read object option, under Access to the object. Click Save afterwards. If you are interested in the file protection, make sure only your account is present in the list of permissions and it has all the access. 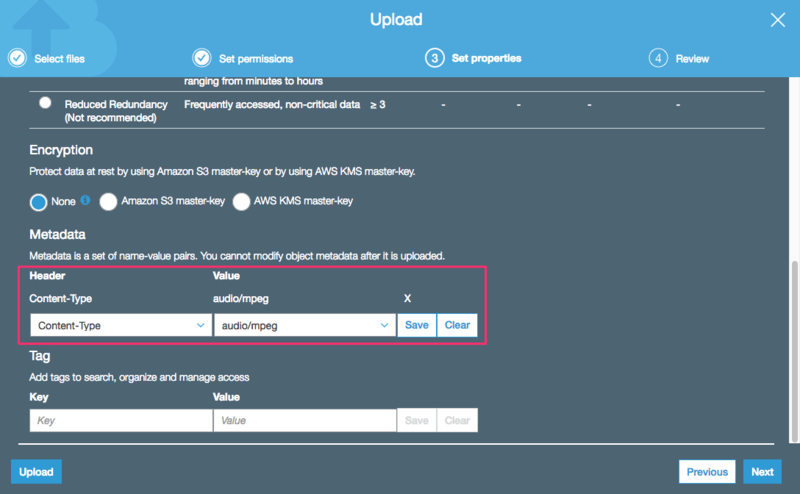 Obtaining the access keys required for playback of private files is described in the Obtaining the AWS Access Keys section of this document. The Video Checker is a built-in feature that is used for detecting issues with the source video. It generates an overview of the video's encoding settings and also shows suggestions on what should be changed if there is something wrong. You can read more about this feature in the guide How to Use the Built-in Video Checker. If the video doesn't play, make sure you check it out when you are logged in as admin. You will notice a message in the top left corner of the video. If it's green and says "Video OK", it means our video checker found no issues. Note: If you don't see any message then double check that Disable admin video checker is not selected at Settings > FV Player > Sitewide FV Player Defaults. Clicking on the error reveals error details. make sure you set up the access keys (steps no. 1 - 11). The AWS Access Key ID you provided does not exist in our records - it means that you provided the wrong access key. 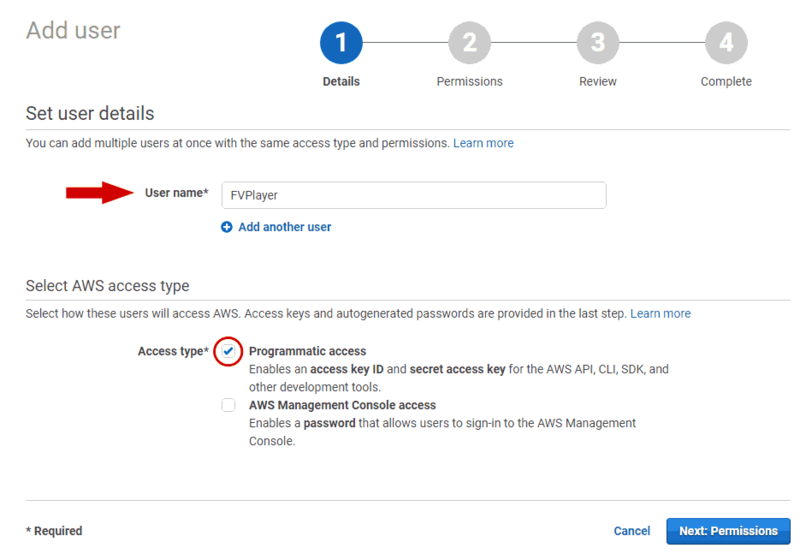 To obtain the proper access key, refer to the Obtain your Amazon AWS access credentials part of this guide. We recommend that you check this guide step-by-step to find the cause of the issue. 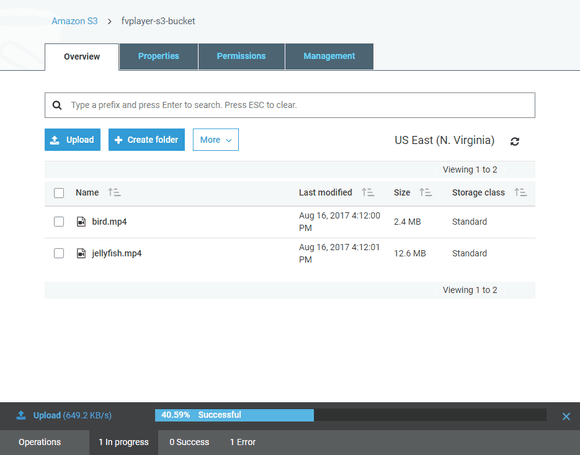 is my file or folder in a bucket named correctly? try setting up a new key pair for your IAM user - perhaps you just failed to copy the key properly. Refer to the Obtain your Amazon AWS access credentials part of this document. 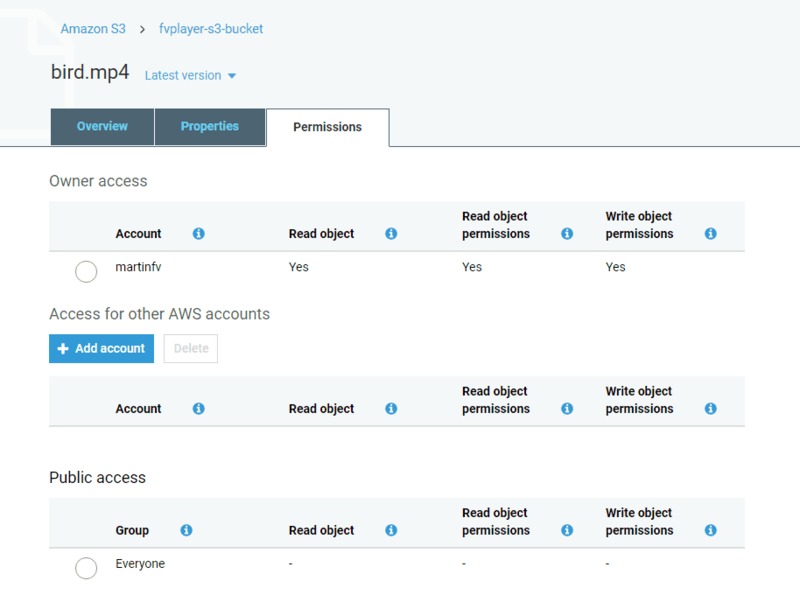 try setting up a new IAM user altogether - are you using the same AWS account which has the S3 bucket you defined in step no. 17 of this guide? If the video checker says "Admin: Video OK", then your setup is correct, and the video plays correctly! The video URL is visible in the page HTML, but it's only valid for a short time (depending on your Default Expiry Time setting or the video length), so the video can't be linked from other (unauthorized) websites.